Imran Tahir took 6/24 including his first ODI hat-trick to help South Africa trounce Zimbabwe by 120 runs on Wednesday. Imran Tahir took 6/24 including his first ODI hat-trick to help South Africa trounce Zimbabwe by 120 runs on Wednesday. Chasing 199, Zimbabwe were bowled out for 78 as they lost 6/20 in six overs to hand the ODI series to the Proteas. Dale Steyn was adjudged the Man of the Match courtesy of his maiden ODI fifty (60) and two wickets. Earlier, South Africa won the first ODI against Zimbabwe by 5 wickets. Dale Steyn is on fire! He is consistently bowling at more than 142 kmph and troubling the batsmen with each delivery. Quite a few of them are rising sharply off the pitch. Craig Ervine is getting hit repeatedly on the body and has no clue how to defend. Steyn's figures- 4 ovs 15 runs and 1 wicket so far. Dale Steyn returns to the side with his maiden ODI fifty to salvage the innings and pull the Proteas to 198 all out - their second lowest ODI total against Zimbabwe. Will they be able to defend it to claim the series? Andile Phehlukwayo was dismissed and that ended an extraordinary 75-run partnership for the eighth wicket between him and Steyn. Steyn remains unbeaten on 43 though. Steyn and Phehlukwayo have incredibly put up 58 runs of the 8th wicket. The two part-timers may have saved this match for South Africa. JP Duminy dismissed by Kyle Jarvis and South Africa are tottering now. Pitched in line and straightened up to hit Duminy's pads. 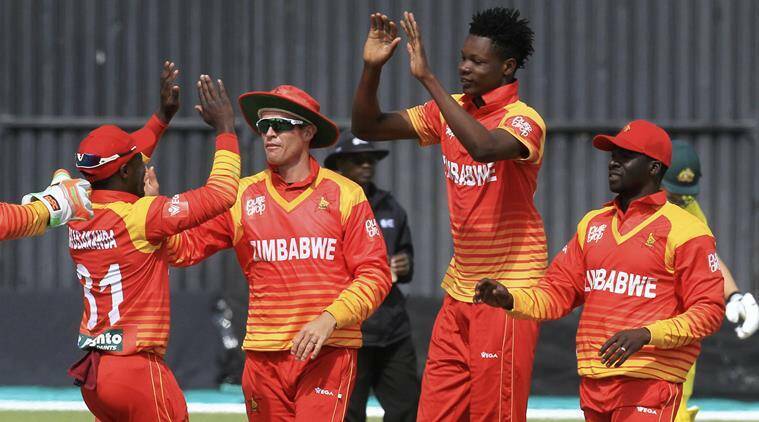 Zimbabwe go up in appeal and the umpire gives it. The Proteas lost Christiaan Jonker after he put up a partnership of 36 with Khaya Zondo. Zondo was later dismissed and it is now skipper JP Duminy in the middle with Andile Phehlukwayo. South Africa are in a spot of bother here. Seamer Tendai Chatara comes out to bowl from the other end. He was excellent with the new ball in the first game. But this match, he starts off with the wide. Dean Elgar and Aiden Markram out to bat for South Africa and it is Kyle Jarvis who starts off with the new ball for Zimbabwe. HERE WE GO! Hamilton Masakadza: It looks a very good wicket. Definitely excited about it (playing his 200th ODI). Just one change, (Wellington) Masakadza out for Trirpano - extra seam seamer. Should be a high scoring game. Will look to restrict them to a score of around 260 and then chase it down later. JP Duminy: Looks like a good batting surface and we'll bat first. We want to test our batting. Good opportunity for the youngsters. Mulder sustained a fracture while practicing and Zondo replaces him. Steyn comes into the team. The responsibility (fifth bowler) lies on me. It's a great opportunity. SOUTH AFRICA WIN TOSS, ELECT TO BAT FIRST! Should South Africa look to bowl first again or would they want to test their batsman and look to bat first. If Zimbabwe win, they are likely to opt to bowl first. Will Dale Steyn play today? South African seamer Dale Steyn had to sit out from the first ODI. But will he be playing today? South Africa really do not need a bowling change at the moment. Zimbabwe skipper Hamilton Masakadza will be donning the international ODI cap for the 200th time for his country. He would want to mark it as a big victory over South Africa. Hello and welcome to our Live Blog on the 2nd ODI between South Africa and Zimbabwe. South Africa were expected to have a cakewalk of a task against their neighbouring nation in the first ODI. For a while it was. Chasing 118 looked like an easy task. Then the inexperienced South Africa batting line-up showed that they might not be quite up to the task. South Africa lost 5 wickets and at one stage, looked extremely vulnerable. Questions must be asked, what if Zimbabwe had put more on the board? Is this team ready for World Cup - with much more difficult opponents? In the 2nd ODI, some questions might be answered.